Loggers looking to keep pace with top-level operators in the industry could look to the new features of the John Deere 900K/H Series tracked feller bunchers and harvesters. These features will likely increase logging productivity and efficiency, according to a company release. Both the 900K-Series tracked feller bunchers and 900KH-Series tracked harvesters are now equipped to take on even more of the forest with the introduction of an updated boom structure. According to the release, the new boom systems are designed to be durable, resulting in longer machine life and added uptime, while also reducing maintenance costs. The new boom structure includes an additional foot of maximum reach, and two feet of additional minimum reach, allowing feller bunchers to cover 32 percent more area. These improvements allow the felling head to tuck tighter to the machine to improve maneuverability in close quarters, as well as reach stems farther away. The addition of the new Rapid Cycle System (RCS) is also now an option on all 900K-Series Tracked Feller Buncher models, allowing operators to control boom, stick and felling head trajectory with a single joystick. The aim is to improve machine productivity and efficiency as well as reduce cycle times and operator fatigue. Research shows the best logging operators had nearly twice the productivity of the worst operators, with a focus on moving the boom a shorter path, keep the boom moving nearly all the time, and obtaining a better and more efficient boom working angle. 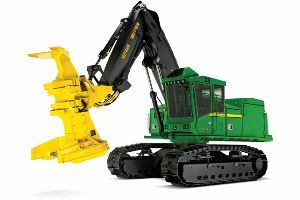 Neil Harber, product marketing manager at John Deere Construction & Forestry Division, says about the new features, "We're confident our customers will appreciate the higher productivity rates, increased uptime and lower daily operating costs with these improvements to the tracked feller bunchers and harvesters." The new features on the John Deere 900K/H Series tracked feller bunchers and harvesters aim to increase machine life, while simplifying and improving productivity on the worksite, allowing operators to keep pace with industry leading loggers.